Manufacturer of a wide range of products which include institute chairs. As a noteworthy entity of this domain, we manufacture, supply and export the premium quality of Institute Chair Contemporary design, alluring appearance and seamless finish, makes the auditorium seat highly demanded. 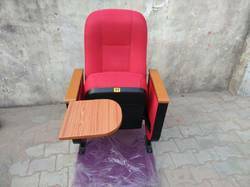 Our customers can avail the auditorium seat in various sizes and designs, as per their requirements.